It made the list for 2 very good reasons. First of all, it's a very cool, very rare (1 of 2) car. Secondly, the original auction post is the most read car post in the history of JaCG (The posts I wrote about my friend Jeff's issues with the city of Stockbridge, MA, still hold the record for number of "hits", but they weren't about a car, per se.) It's been a lot of fun following this car for the past few months. 4. A Perfect 1978 MGB - I know it has rubber bumpers. I don't care. 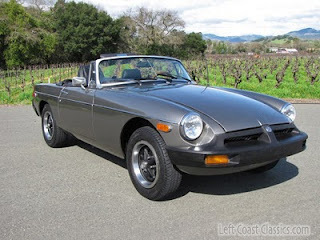 This is a very nice MGB. I owned an MGB in the late 80s / early 1990s. I kept it for a few years and then moved on to something else. Had mine been like this one, I might still have it. 3. 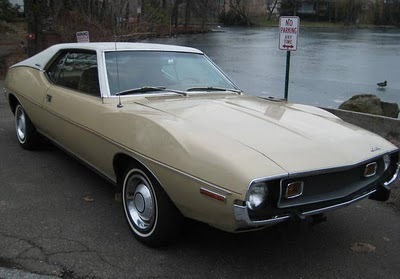 1974 AMC Javelin - A Mom's Muscle Car - Right up front let me say that I really like the AMC Javelin. Given a choice between a Javelin and a Mustang, Camaro, Firebird, etc., I'd take the Javelin every time. I'd want it to be a later AMX or SST Javelin, though. This is most definitely not an AMX or SST. It is, however, the way most "pony cars" were sold in the 1960s and early 70s. The high performance versions that we drool over today didn't sell in great numbers. Most pony cars came through as sensible cars that could be driven every day. This Javelin is the type of car you most often saw on the roads in the 60s and 70s. 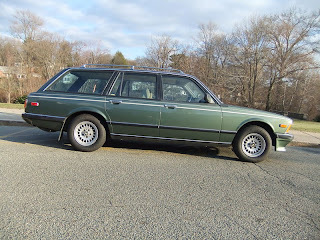 I'm not crazy about the exterior color combination and the interior can make you car sick even when the car is not in motion, but it is so cool to see a car like this still around, unmodified, and in great condition. 2. 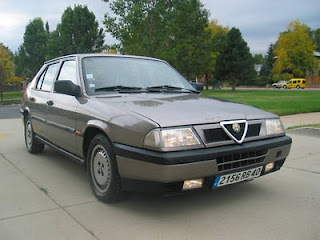 1983 Alfa Romeo 33 - Readers on every continent other than North America are looking at this car and thinking, "So? It's an Alfa 33. What's so special?" It's special in North America because Alfa never sent these cars to us. This car was privately imported. The 33 was not Alfa's greatest car, of course. But, being FWD and using a flat 4 engine, it was different from anything we ever saw from Alfa. By the time this 1983 model was built in 1990 ;), Alfa had corrected most of the problems that had plagued the car since the days of its predecessor, the Alfasud. They also turned it into a really fine looking car. It's human nature to crave the things we're not supposed to have. That's probably why I crave this car. 1. 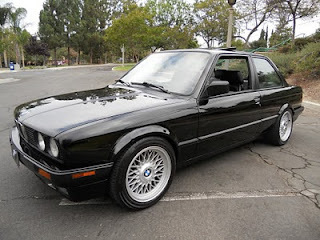 1989 BMW 325i - As I wrote in the original post, some people just know how to do things right. This car just blew me away. It was done so right. This is a "modified" car that an adult could own and love. The modifications that were done to it were useful and tasteful. The body doesn't look boy-racerish and the mechanical mods don't prevent it from being an easy to drive everyday-driver. The person who bought this car left a comment on JaCG. He said the car is everything the seller said it was. He's a lucky man. This is the perfect JaCG car. It's unique, affordable and fun. Being a BMW, you can throw "reliable" in there, too. This is a just great car. This Top 10 list was a lot harder to do than I expected it to be. Honestly, I thought this would be an easy New Year's Eve / New Years Day post. Something I could knock off in 20 minutes or so. Nope. This took what seemed like forever. There were so many great cars available in 2010. Figuring out the Top 10 was difficult. I could have easily done a Top 50. Hell, I could have done a separate Top 10 Alfa list or a Top 10 BMW list. There were Rovers, TVRs, Austins, Peugeots, Audis, Volvos, Mercedes', Triumphs and Saabs that could have made the Top 10. It was almost painful to eliminate them. As I wrote in yesterday's post, this is all opinion. Feel free to chime in with yours. I also like the cars that you picked today. It's difficult to choose among literally a few hundred cars, as were featured on the site. 10. 1986 1/2 Pontiac Grand Prix 2+2 Aerocoupe. Because it's a rare domestic car made in the 80's that is a white trash mobile due to its NASCAR tie-in, but it still looks cool to me. 9. 1975 Chevy Cosworth Vega. It's more the idea of the car than actual performance, which isn't as great as you'd hope. It still looks sharp to me, though. 8. 1980 Renault 5 Alpine. I'd love to drive a French car. Heck, I marked out when randomly a few months ago I spotted a Le Car being driven around in my town. This imported car would probably be fun to drive. 7. 1966 Humber Super Snipe. A car being named "Super Snipe" is pretty sweet. It's also a "British Buick", which amuses me. 6. 1990 Yugo Convertible. It's a Yugo Convertible. It's extremely rare. As was stated, I'm more likely to see a Veyron drive by than this car... and I don't live that far from where this particular car was sold. I'd get a lot of attention for driving it. 5. 1970 Ford Taunus. It's a car imported from Germany that looks as if it was always an American car. As German is part of my heritage, it'd be nice to drive. 4. 1991 Aston Martin Virage. British is also part of my heritage so I wouldn't mind driving a sharp-looking car like this. 3. 1985 Bitter SC. It has a great profile and you can find it (and maintain it) for cheap, and yet it's still rare. 2. 1985 ASC/McLaren Convertible. You can also say the same about this modification of the Mercury Capri. It performs great and I'm sure it's a blast to drive in the summer. 1. 1994 (?) Maserati Ghibli Turbo. OK, so it was a car that I submitted to the site. I do feel honored whenever my submissions end up being featured. But, I really dig how the car looks and I wish it would have been brought to the US market to sell. The eBay listing for the vehicle got removed, for some reason. The seller (from the Toronto area) also sold the Lancia Thema 8.32 that was earlier featured on the site and a Fiat Barchetta convertible that looks like a Miata but also has enough Italian-ness. 1980 Citroen CX Loadrunner. It's a Citroen, so that's usually wacky enough, but it was a 6 wheel modification designed for newspaper delivery in Europe. 1997 Fuqi FQ2022S. It's a Chinese SUV that somehow made it for sale in the US. Good luck titling it, though. It was sold in Massachusetts, so I'm surprised that JACG himself-Dave-didn't go out and buy it! I remember that his mechanic friend had to work on more obscure vehicles in the past, and not always to his immense pleasure. I can only imagine him having to try and figure out how to maintain an SUV like this. The two Rolls-Royce trucks. What a strange and yet great idea. I am glad I stumbled upon this site one last night last year. I always enjoy it and I am sure I will keep on enjoying the vehicles that get mentioned this year. The fact that I was able to make a few submissions is even better. I will always appreciate that Mr. Dave here has been going strong for so long, at least in terms of blogs like this. and I'm sure it will keep on going for many months to come. There, that's the link to the ASC/McLaren Convertible. It was a long night for me last night.